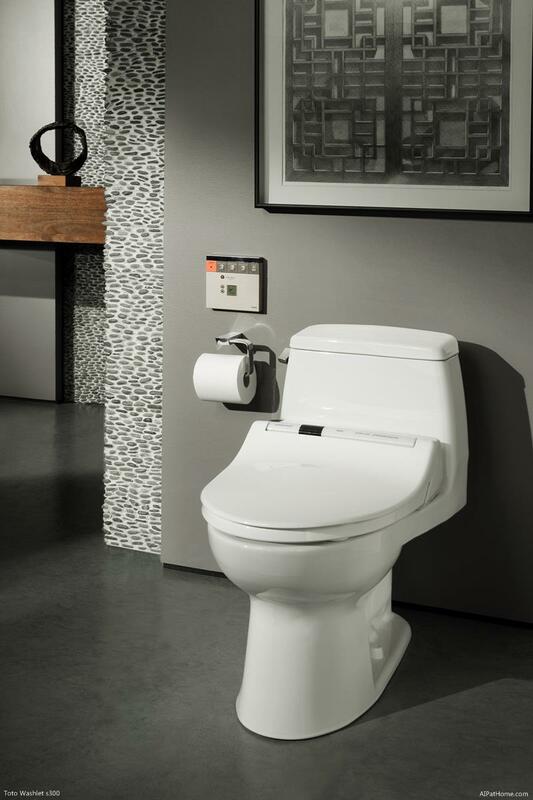 TOTO Washlet s300 for the universal design bathroom. At age 60+, active baby boomers consider themselves young and vital; however, they should also be looking ahead at the time when they may have health and mobility issues. They enjoy lives full of travel with stays at luxury hotels, and they want to bring that level of luxury to their own home. Going Green with Universal Design elements does not mean going primitive or sacrificing luxury when remodeling their bathroom. Today, high-fashion luxury fittings and fixtures are also sustainable and universal in design. remodeling increases the resale value of the home. Today, master bathroom has become more than a “wet cell” — toilet room with tub, shower and sink squeezed in. Rather this bath space has become a refuge from the 24/7-wired world. It has become an in-home luxury spa — an intimate zone that merges bedroom and bathroom. Empty nesters can afford to sacrifice a closet or adjacent room to make more space available for the new master spa bath. As this merger takes place, the toilet spins off in a separate orbit and, perhaps, its own more private space. Separate toilet rooms or privacy walls remove this waste removal unit from the bathing and relaxing that takes place in the majority of the space. Like trends in bathroom remodeling, everything evolves—including the concept of clean. 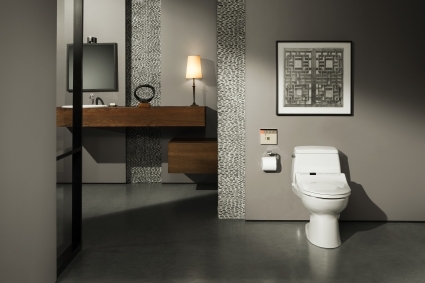 With TOTO’s innovative Washlet products, the bathroom experience progresses from mundane to luxurious; from primitive to modern; from awkward to the epitome of clean. Since their introduction in 1980, TOTO’s revolutionary Washlets have sold more than 20 million units worldwide. Currently, 2.7 million Washlets are sold annually in Japan, where warm water personal cleansing systems have deeper market penetration than microwave. What exactly is a Washlet? Is it a fancy toilet? A bidet? Actually, it’s neither. Basically, the TOTO Washlet is a toilet seat (a pretty remarkable toilet seat) that’s easily installed on virtually any toilet. It uses pure, clean water– and a bunch of nifty technology – to make you cleaner and more refreshed than you ever felt after a bathroom break. So, who’s it for? Everyone … young, old, women, men, women who are pregnant, people with mobility issues. But mostly, people who just want to feel cleaner, better, and happier. People like … well, you. Using it couldn’t be simpler, or, as you’ll know from the first time you sit on the heated seat — comfier. Washlet makes it all so easy: You just sit down, do what you came to do, and then reach for the remote. Select the area you want to wash. And, with the push of a button, the Washlet does the rest. A small wand, just below the seat, extends. And a gentle stream of warm aerated water cleans you. Precisely. Comfortably. Completely. Nothing touches you but the water, and the water goes only where it needs to go. And by the way, the wand cleans itself — automatically — before and after every use. Push another button, and warm air dries you. The Washlet can even neutralize the air in and around the bowl, leaving it fresh. And the SoftClose seat shuts without a sound, so no one will know you were ever there. Nice. First, it lowers the impact on the wastewater reclamation system by reducing use of paper products by 50% to 90%. That may not seem significant until one realizes that Americans use more than 3.2 million tons of toilet paper annually, cutting down 54 million trees in the process. The production of each roll requires an average of 1-1/2 pounds of wood, 37 gallons of water and 1.3 kilowatts of energy, and it involves toxic chemicals such as chlorine. Rear Cleanse: 0.07 to 0.11 gallons/minute. Front Cleanse: 0.08 to 0.11 gallons/minute. Third, it uses energy efficiently. The Washlet has two types of energy saving features — timed and automatic. The timed energy saver simply shuts the unit down for the user-determined length of time (either 3, 6 or 9 hours). The automatic energy saving mode uses “fuzzy logic” to determine the user’s patterns. The Washlet remembers a day as 32 time increments (45 minutes each). It records the day’s patterns and compares it with the last 8 days. If the Washlet was not used during the same time period for two or more days over the last 8, it will consider that a period of infrequent use and power down (like a computer). The unit will return to normal if it detects a user during the energy save mode. Both modes can be used together. 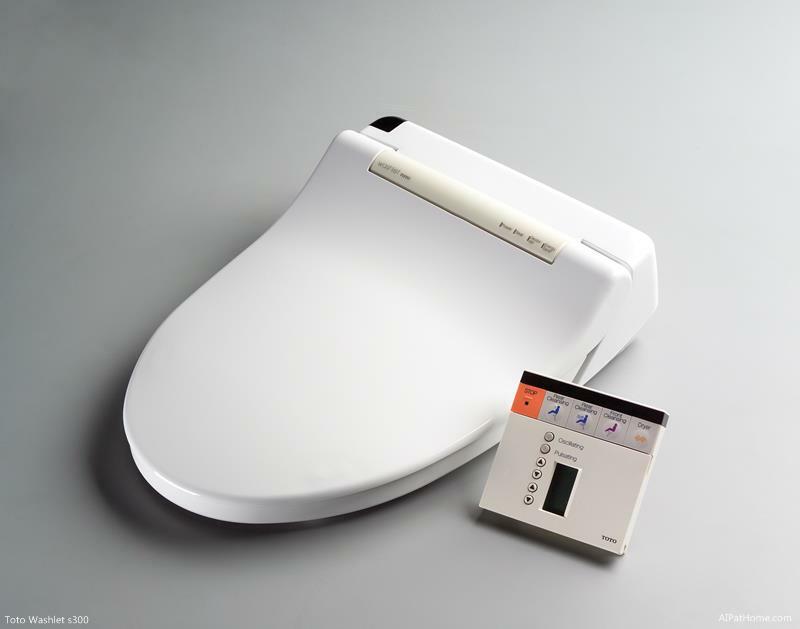 TOTO has taken the Washlet seat to the level of high-tech luxury with its wireless remote control keypad and easy-to-view LCD read-out, which can be hand-held or remain in its own convenient wall-hung holder. The remote control unit operates such functions as the front and back warm water spray that can be regulated for the preferred water pressure, temperature level, and cycling motion massage. It also controls the warming unit in the ergonomically contoured seat, which is heated to provide maximum comfort even on the coldest days. An integrated sensor maintains the desired setting. It also controls the warm air dryer function, pulsating water massage feature, and catalytic deodorizer, which uses activated oxygen to break the molecular bonds of odor and return clean air to the room – no matter the ventilation. This unit also controls the built-in energy-saving mode: once installed, the Washlet S300 begins to learn its users’ usage patterns, re-educating itself at least once a week. The Washlets – C100, E200, S300, and S400 — retrofit on to any existing toilet homeowners may have installed and easily plugs into a 120V AC GFI outlet. It is available in elongated or round front bowl styles and is offered in Cotton, Colonial White and Sedona Beige.